Attention All Maximumfun.org Donors! Brian Wilson Wants to Give You His New Vinyl. 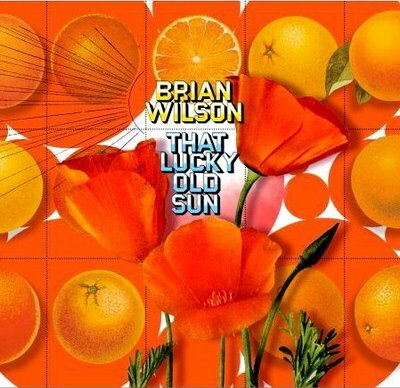 What album took Brian Wilson 37 years to complete, and was finally released in 2004? Attention Again: We have selected the winners and they will be notified as soon as we figure out how many vinyls we can send out. Thanks for entering. You guys are so smart. 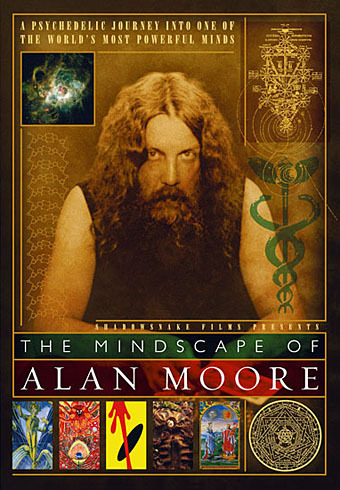 Who Wants "The Mindscape of Alan Moore" DVD?! Congrats to Cory, Tim, and Mark. You guys are so smart. The second Maximum Fun Drive is six weeks or so away, and I want to have a special thank-you gift for people who support the show. Since our regular TSOYA t-shirts, while awesome, have been available for some time, I thought I'd put together a contest to find a design for a special, one-print-run shirt specifically for the drive. If you're a designer, well, make a design. Then post it to Pixish. If you're not a designer, visit the Pixish page and give a thumbs up or down to the shirts that have been submitted. The top five vote-getters will get iTunes giftcards. The overall winner, chosen by myself and a CELEBRITY JURY, will get two shirts of their design, a pair of super-high-quality headphones for their iPod or home stereo (either in-ear or over-the-head), and my voice (or Jordan's, or me and Jordan's) on their home answering machine. Plus the satisfaction of contributing to your favorite shows/blog/community/website/etc! If you'd like to share ideas, but don't do much design yourself, or you want to talk about designs as they're submitted, there's a special forum thread for the contest here. 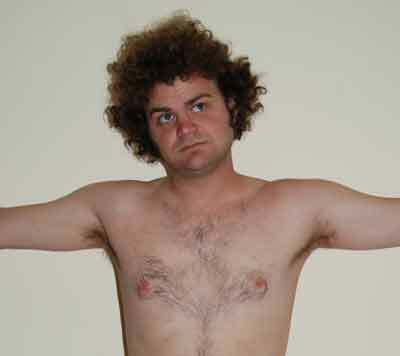 * Please use no more than three colors, and use a basic American Apparel tee color as your background. * Entries must be submitted by the end of April, and the sooner the better! * No more than five entries per person. * Entries must be uploaded as an image to Pixish, and you must also be able to provide the graphic in a format that satisfies the printing requirements of BroPrints. * I reserve the right to appoint psuedo- and semi-celebrities to the celebrity jury. * Shirts can but need not have text, and should be of significance to anyone who downloads The Sound of Young America, Jordan Jesse Go, or reads this blog. The following entries have been chosen as winners in the TSOYA Holiday Awesome competition. Congratulations to all the winners, your prizes are in the mail. The standard of the entries was really high – I had a tough job judging them. Thanks to everyone who took the time to enter – they were all great - you’re all winners in my eyes! That’s it from me as intern with TSOYA I’m afraid – I’m heading off back to Ireland.  I really enjoyed my time here. Thanks to Jesse and Theresa for being so awesome! And thanks to all you guys who I’ve been in contact with during my time here. Prize: Dr. Katz DVD Collection. Dave Shumka gave us this amazing JJGo Montage! I love this! Check out Ramsey Ess’s Christmas cartoon..
Prize: The Chapelle Show Collection. Emily Tilles showed us her baking and decorating skills with this fabulous and original Darth Vader Christmas cookie. Carol Martucci make some fantastic origami Christmas decorations – which now have pride of place on Jesse, Theresa and Cocoa’s Christmas tree. Sorry I haven't got any pics of the decorations! Justin Zell gave us this awesome Santa Con video. Prize: The Dangerous Book For Dogs. 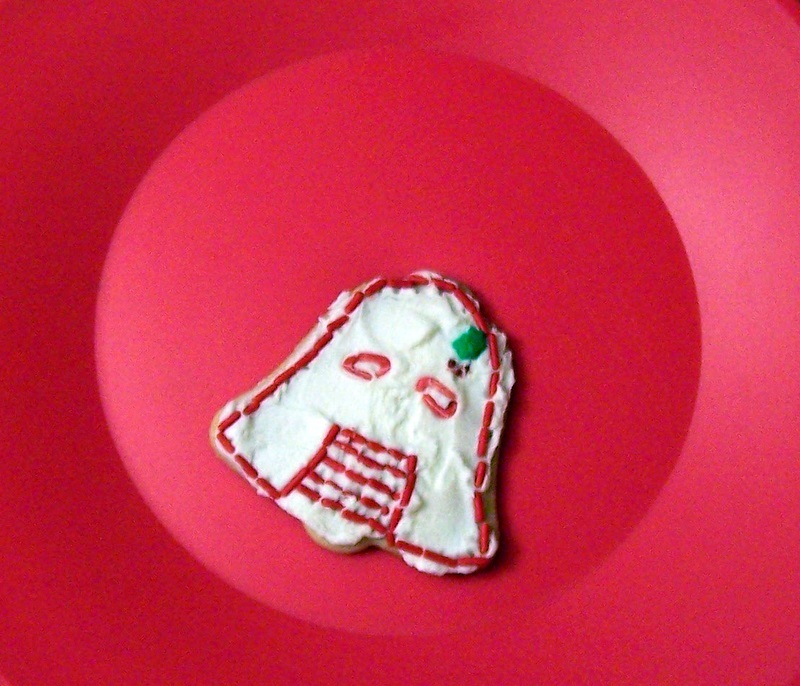 Tom Deja gave us this super Holiday Mix – he also did the illustrations and jewel case design! Have a listen on iTunes or any other music player you might prefer. 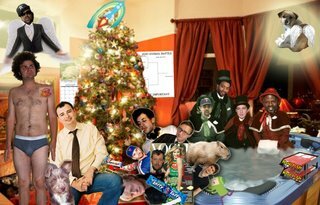 This is Ben Watt’s John Hodgman Christmas tree – I’m pretty sure he super-imposed a pic of John’s head onto a photo of a Christmas tree and hasn’t actually chopped off John’s head and stuck it on his real live Christmas tree at home. I take in the scent. Ten miles to the ocean. past palm trees and mirages of smiling faces. and brown wrapped packages on doorsteps. with the warm scent of asphalt. and in the well of my chest. Salt begins to fill the air. that have brought me back. the sun beginning to set. than God could ever imagine. 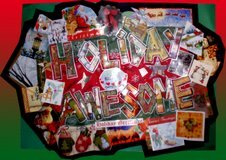 Resa Latour’s “Holiday Awesome” collage is pretty neat, don’t ya think? Chad Johnson sent a beautiful Christmas bookmark – apologies that I don’t have a copy to show you on the site, but trust me it’s awesome! 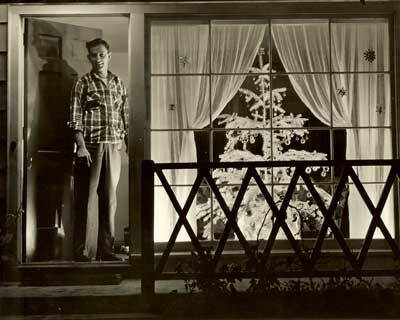 Gather round the yule log, for it is time for The Sound of Young America Holiday Extravaganza. Two complete series sets of Dr. Katz, Professional Therapist. Two complete series sets of Chappelle's Show. Two copies of The Onion's all-new, all-original atlas, Our Dumb World. 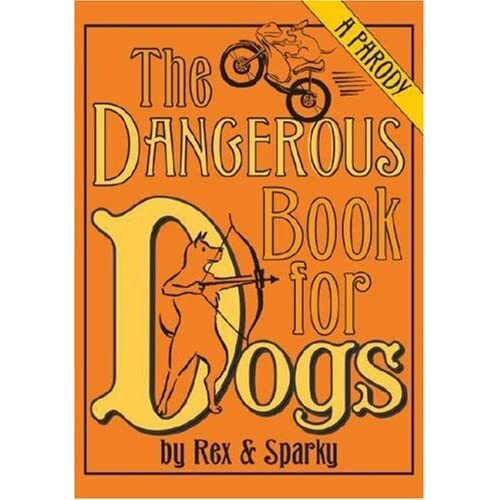 Two copies of The Dangerous Book for Dogs, a parody of the Dangerous Book for Boys by more Onion folks. 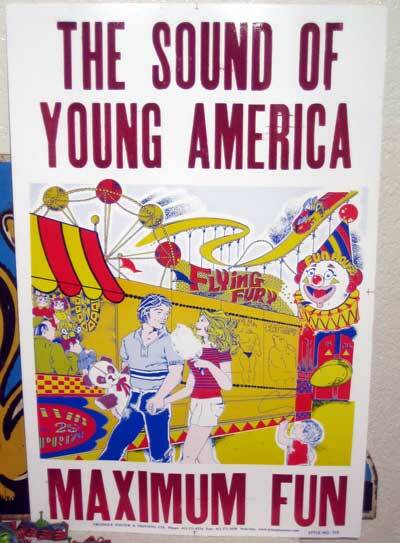 And two of our new Sound of Young America posters. In order to enter this contest, you have to be a Sound of Young America monthly donor. If you're not one already -- don't worry! You can become one easily. Just visit our donation page, and start giving. You can give as little as a few dollars a month, and the impact of your donation will be huge. It's the holiday season, why not support something you love? When you make your piece, send it (in some internettable form) to our intern Emma with the subject Holiday Extravaganza. Her email is her name @maximumfun.org. Please also include your prize preferences in order and your mailing address. You can make up to three entries, but the contest will be judged on merit, not by random drawing. Of course, there's a lot of merit in anyone who donates to The Sound, so we'll send a small prize to any TSOYA donor who enters the contest. All entries must be received by the end of the day on Thursday, December 20th. We'll pick winners on Friday! Hey everyone... another giveaway up for grabs. 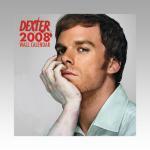 Season 1 of the hit tv show Dexter is now on sale but you can get a copy right here for free! Not only that, there's also a music cd from the series plus a poster you can hang on your wall, or ceiling or wherever! To get your hands on the loot: just email our intern Emma (emma@maximumfun dot org) with your name, address and tell us the name of Dexter's boat in the series. Please note that this contest is open to Maximum Fun donors only. You have until 5PM Pacific this Thursday 8th November! Good luck! Hey gang... neat giveaway today. 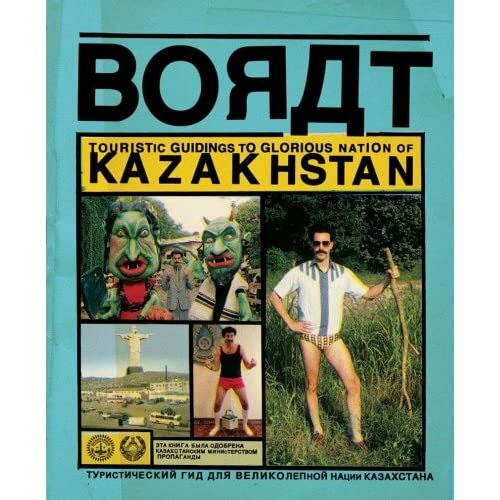 There's a new Borat book coming out shortly, called "Borat: Touristic Guidings to Minor Nation of US and Touristic Guidings to Glorious Nation of Kazakhstan." To celebrate its release, I've got a copy to give away. 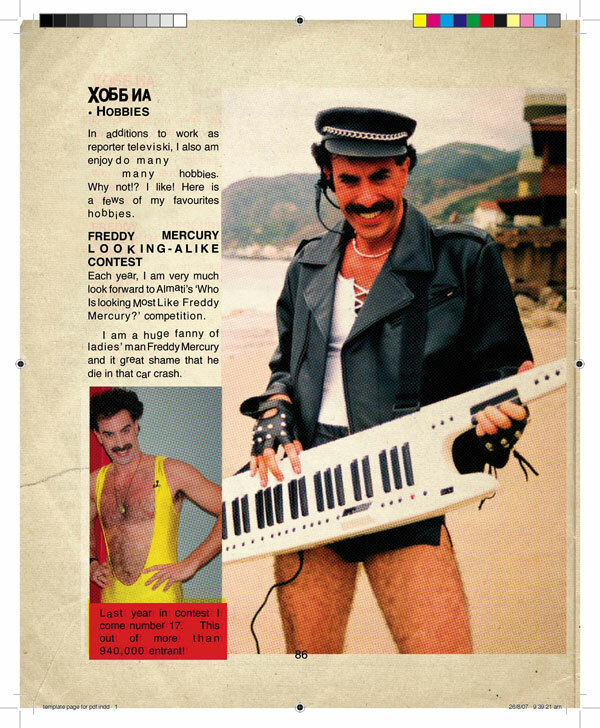 Here's how you can get a copy: just email our intern Emma (emma@maximumfun dot org) with your name, address and the name of the traditional Kazakh song which Borat teaches to a group of country & western fans in da Ali G Show. Please note that this contest is open to Maximum Fun donors only. You have until 5PM Pacific. We've been talking a lot about Jordan's clothes on Jordan, Jesse GO! lately, and on last week's show, Carl from Detroit suggested something truly brilliant. Specifically: The Jordan Morris Paper Doll Project. Here's how it works. We've uploaded three photos of Jordan in his underwear to our Flickr group. #1, #2, #3. Your job is to add clothes. 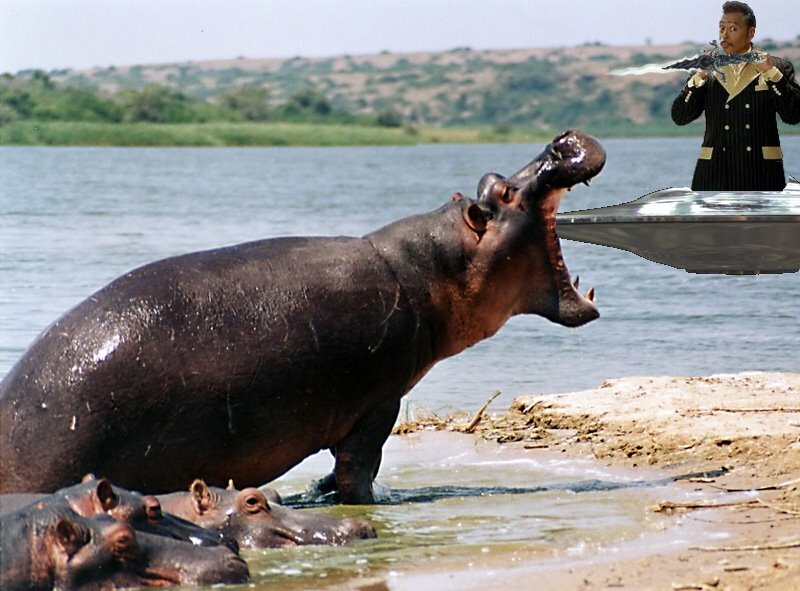 Draw them on, use photoship skills, cut-and-paste. Make Jordan look nice. Then, upload your pictures to our Flickr group with the tag "jordandoll." We'll highlight favorites on the forum, and probably give out some prizes if we can think of some good ones. 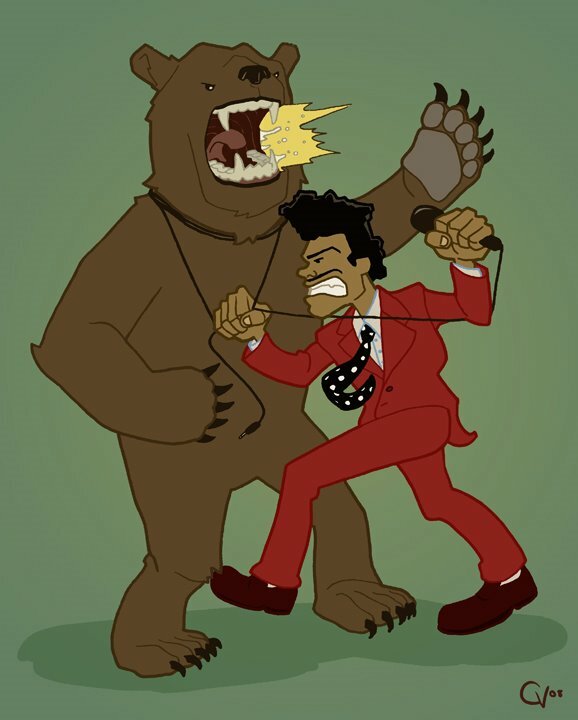 Contest: Zach Galifianakis's Bad Art Auction! Hey NYC area max-funsters/Galifianakers/Indie rock lovers/bad art hounds - this contest's for you! July 10th, at the Hiro Ballroom in New York, Zach will be hosting a charity event for New York Cares in which "really bad, really funny" art will be auctioned off to the highest bidder. And if that doesn't already sound like a blast and a half, the auction will be followed by a full set from reverb-rockers Band of Horses - who's Everything All The Time was, to this Intern's mind, one of the better debut albums OF THE MILLENIUM. I've also seen them live, and they are indeed top notch. IN ADDITION, it's their only show scheduled in NYC the whole summer. In a classic episode of Seinfeld, Kramer takes on an NYU Intern to assist him at Kramerica Industries. WHAT IS THAT INTERN'S NAME?